Tomorrow is my four year wedding anniversary to my gorgeous husband. Four years married and 14 years since our first date, seems like such a long time! We decided on our first wedding anniversary that we wouldn’t buy gifts for one another, instead we would go out to dinner every year. Granted, my husband does negotiate for a living, but really? How and why did I agree to no presents? I was pregnant on our first wedding anniversary, did that have something to do with it? What was I thinking? Every girl loves a present! The four year anniversary is linen and silk – that would be nice! I only joke, dinner out is so lovely and every year I really look forward to choosing a restaurant together and going out. 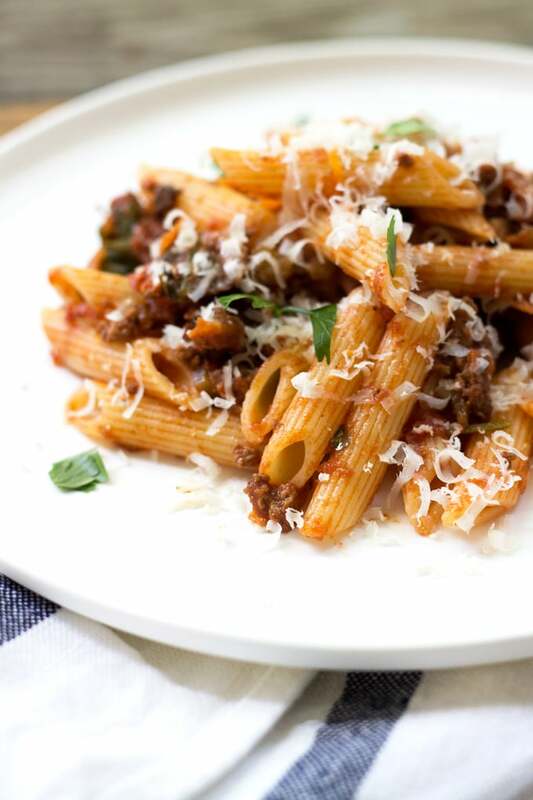 Although we’ve said no presents, I’ve got a little present for my husband – his favourite food in the whole world – his Mum’s bolognese with penne pasta which I’ve renamed Quick Beef Bolognese with Penne. I can’t quite master the original as well as his Mum, but I think I do a pretty good rendition. Growing up my husband claims he had this 2-3 times a week, when my husband finds something he likes, he sticks to it. Soon after we met he had taught me how to make it in the little microwave we had a university and we were having it a few times a week too. Nowadays I like a little variety in my life and only make it twice a month which he thinks is outrageous! He claims he is deprived and that he ‘never has pasta’. Balance is a good thing dear husband! 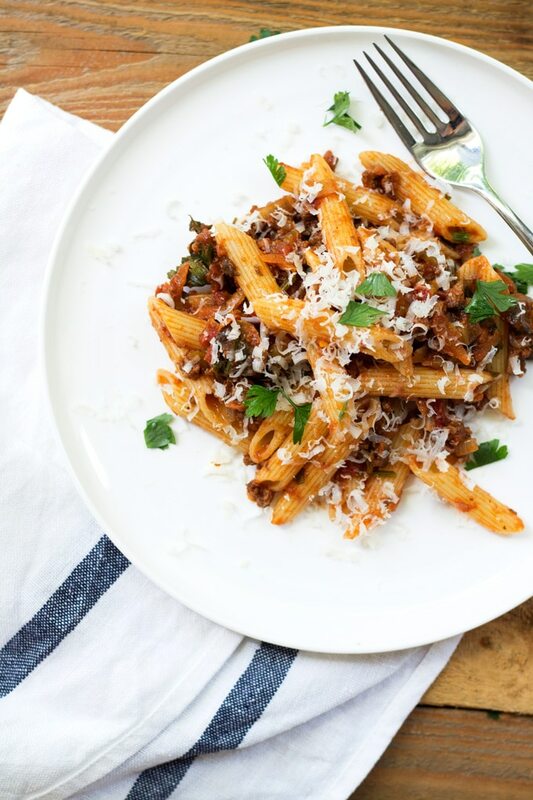 This Quick Beef Bolognese with Penne really is such an easy meal to make and a perfect weeknight dinner or make ahead dinner. 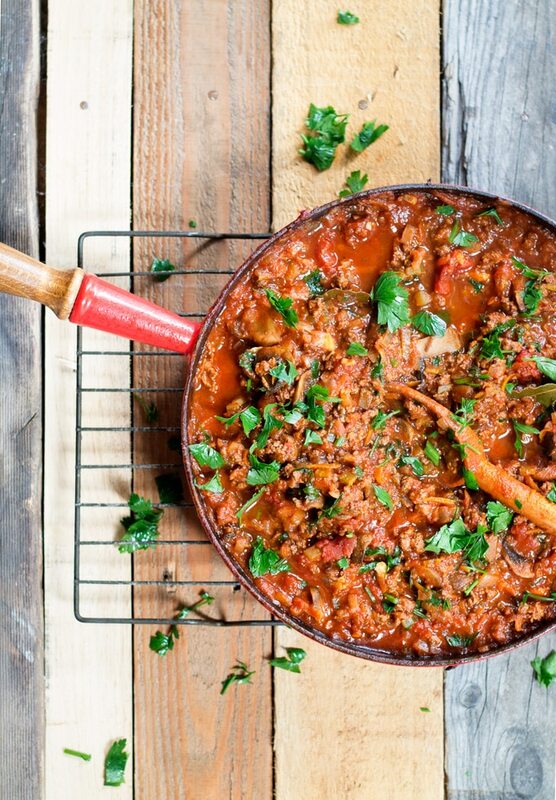 It’s much like a bolognese but isn’t cooked for hours on end or have any milk, but has a great depth of flavour and a slightly fresher taste to your traditional bolognese. 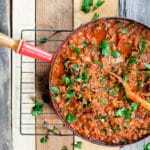 It’s got your classic onion, carrot and celery mix with beef, herbs and a tomato sauce. My mother-in-law hates mushrooms but I love them so I’ve included them as my little rendition of the dish (sorry Colleen)! It’s also great with some baby spinach or grated zucchini mixed through, although I do get in trouble if I stray too far from the original. 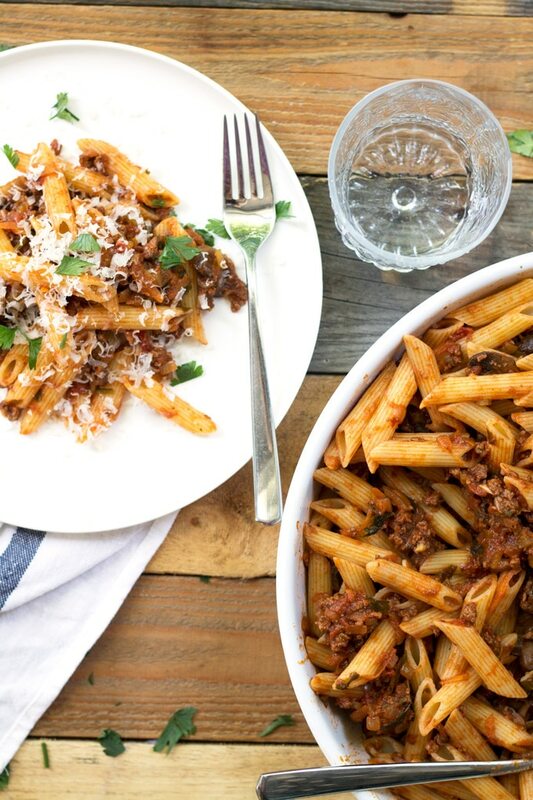 You can really put this with any dried pasta, but the classic, I’m told, was always done with penne. Leftovers are pretty good the next day for lunch (or in my husband’s case, breakfast). I hope your family likes this as much as ours! Add oil to a large frypan (skillet) over high heat. Add the ground beef mince and brown, approximately 5 minutes. Remove from the pan and set aside. Lower the heat to medium-low and add the onion to the pan with a generous pinch of sea salt. Sauté until soft, approximately 3-4 minutes. Add celery, carrot and garlic and continue sautéing for another 3-4 minutes until soft. Add red pepper flakes and oregano and cook for another 1 minute. Return the beef to the pan and add the tomato paste. Stir and cook until the tomato paste becomes fragrant, approximately 1 minute. Pour in the white wine and continue to cook until you no longer smell the raw alcohol smell and the wine has been absorbed, 2-3 minutes. Stir in the crushed tomatoes, passata, beef stock, bay leaves and mushrooms into the mixture, lower the heat to low and simmer for 25 minutes to allow the sauce to thicken and mushrooms to cook. While the sauce is simmering, cook the pasta in a big pot of salted water (salty like the sea) according to directions on the packet (usually about 10-12 minutes for penne). Reserve half the flat leaf parsley (or sweet basil) as a garnish and stir in the rest to the sauce. Combine the pasta and sauce and sprinkle over the parsley and some grated parmesan. Serve with a green salad and crusty bread. Looks delicious. I have some mince in the freezer and I will try this recipe tomorrow. I never know what to cook with mince. Have a great anniversary dinner tonight. Thanks! We had a wonderful dinner at Masu. Hope you enjoy the pasta, I know Dad will!